Yashwant Sinha (born 6 November 1937) is a former Indian administrator, politician and a former Minister of Finance (1990–1991 under Prime Minister Chandra Shekhar and March 1998 – July 2002 under Prime Minister Atal Bihari Vajpayee and Minister of External Affairs July 2002 – May 2004). He was a senior leader of the Bharatiya Janata Party before he quit the party on 21st Apr 2018. His son Jayant Sinha, a consultant and investor, won the 2014 elections for the Hazaribagh constituency and is currently serving as Minister of State for Civil Aviation in Narendra Modi's cabinet. In 2015, he was awarded Officier de la Légion d’Honneur, the highest civilian distinction of France. He quit the BJP in April 2018. Sinha was born in Patna, Bihar into a Kayastha family. He received his master's degree in Political Science in 1958. Subsequently, he taught the subject at the University of Patna till 1960. Sinha joined the Indian Administrative Service in 1960 and spent over 24 years holding important posts during his service tenure. He served as Sub-Divisional Magistrate and District Magistrate for 4 years. He was Under Secretary and Deputy Secretary in the Finance Department of the Bihar Government for 2 years after which he worked in the Ministry of Commerce as Deputy Secretary to the Government of India. .
From 1971 to 1973, he was First Secretary (Commercial) in the Indian Embassy, Bonn, Germany. Subsequently, he worked as Consul General of India in Frankfurt from 1973 to 1974. After working for over seven years in this field, he acquired experience in matters relating to foreign trade and India's relations with the European Economic Community. Thereafter, he worked in the Department of Industrial Infrastructure, Government of Bihar State and in the Ministry of Industry, Government of India dealing with foreign industrial collaborations, technology imports, intellectual property rights and industrial approvals. He later was Joint Secretary to Government of India in the Ministry of Surface Transport from 1980 to 1984, his main responsibilities were road transport, ports and shipping. He resigned from service in 1984. Sinha resigned from the Indian Administrative Service in 1984 and joined active politics as a member of the Janata Party. He was appointed All-India General secretary of the party in 1986 and was elected Member of the Rajya Sabha (Upper House of the Indian Parliament) in 1988. When the Janata Dal was formed in 1989, he was appointed General Secretary of the party. He worked as Minister of Finance from November 1990 to June 1991 in Chandra Shekhar's Cabinet. He became the National Spokesperson of the Bharatiya Janata Party in June 1996. He was appointed finance minister in March 1998. He was appointed as Minister for External Affairs on 1 July 2002. In the Lok Sabha elections of 2004, he was defeated in Hazaribagh Constituency. He re-entered the Parliament in 2005. On 13 June 2009, he resigned from the post of vice-president of BJP. Sinha was the finance minister until 1 July 2002, when he exchanged jobs with foreign minister Jaswant Singh. Sinha, during his tenure, was forced to roll back some of his government's major policy initiatives for which he was much criticised. Still, Sinha is widely credited for pushing through several major reform measures that put the Indian economy on a firm growth trajectory. Among them are lowering of real interest rates, introducing tax deduction for mortgage interest, freeing up the telecommunications sector, helping fund the National Highways Authority, and deregulating the petroleum industry. Sinha is also known for being the first Finance Minister to break the 53-year tradition of presenting the Indian budget at 5 pm local time, a practice held over from British Rule days that sought to present the Indian budget at a time convenient to the British Parliament (1130am GMT) rather than India's Parliament. Sinha has written a comprehensive account of his years as Finance Minister titled Confessions of a Swadeshi Reformer. 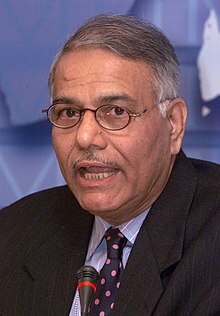 Yashwant Sinha has been accused by opponents, and by other political observers of trying to promote nepotism by nominating his son Jayant Sinha as a successor to contest from Hazaribagh overlooking the interests of many other loyal party workers, though he tried to justify the nomination of his son as a party decision. On 25 April 2015, The French Government honoured him with the highest French civilian distinction of Officier de la Légion d’Honneur (Officer of the Legion of Honour). It was bestowed upon him in recognition of his work as Union Minister of Finance, Minister of External Foreign Affairs and for his invaluable contribution to international issues. While presenting the Honour to Sinha, French Ambassador to India François Richier said as Minister of External Affairs, and Chair of the Indo-French Parliamentary Friendship Group since its very inception (2009-2014), Sinha contributed to the deepening of the Indo-French strategic partnership, launched during the visit of Atal Bihari Vajpayee in Paris (September 1998) and the development of ties between France and India. Created in 1802 by Napoleon Bonaparte, the Legion of Honour is the highest civilian award given by the French Republic for outstanding service to France, regardless of the nationality of the recipients. Sinha has a wide range of interests including reading, gardening and meeting people. He has widely travelled and has led a number of political and social delegations. He played a leading role in many negotiations on behalf of India. Sinha's wife is Nilima Sinha, one of India's leading children's writers and President, Association of Writers and Illustrators for Children. He has a daughter, Sharmila who is a writer and married to Ashok Kantha, an Indian Foreign Service officer. He has two sons, Jayant and Sumant. Jayant Sinha is an Indian Institute of Technology Delhi (IIT Delhi) and Harvard Business School graduate. He was a partner in McKinsey & Company and later a managing director at Omidyar Network. Jayant also contested elections for Member of Parliament from Yashwant Sinha's home constituency of Hazaribagh, which he won by a margin of 159,128 votes, getting a total of 406,931 in his favour. Sumant Sinha is also an alumnus of IIT Delhi, the Indian Institute of Management Calcutta, and was a Dean's Fellow at The School of International and Public Affairs (SIPA) at Columbia University. He is the founder and chairman of ReNew Power, a renewable energy power producer. Yashwant Sinha blogs under the title Musings of a Swadeshi Reformer. On 4 April 2017, Sinha was arrested Hazaribagh district along with MLA Manish Jaiswal and 150 others after trying to hold a religious procession when the police stopped them, leading to them protesting the action with the supporters throwing stones at the police. ^ a b c "Yashwant Sinha, a profile:Finance Minister, Government of India". Archived from the original on 27 September 2007. Retrieved 30 September 2007. ^ "Detailed Profile: Shri Yashwant Sinha". India.gov.in. Retrieved 29 December 2018. ^ "Indian government reshuffled". BBC News. 1 July 2002. Retrieved 30 September 2007. ^ "French Distinction Conferred on Yashwant Sinha". Retrieved 11 June 2015. ^ Ashwani Kumar. Community Warriors: State, Peasants and Caste Armies in Bihar. Books.google.co.in. Retrieved 4 July 2013. ^ "Yashwant Sinha quits as BJP vice president". Ibnlive.in.com. 13 June 2009. Retrieved 4 July 2013. ^ "A welcome rollback". Free Press Journal. 29 April 2002. Archived from the original on 9 February 2005. ^ Confessions of a Swadeshi reformer at publisher site. Retrieved 4 November 2008. ^ Superle, Michelle (2011). Literature: Representations of Nation, Culture, and the New Indian Girl. New York: Routledge. p. 27. ISBN 9781136720871. Retrieved 4 September 2014. ^ Sadanandan, Renuka (21 February 2010). "A fourth-generation author: She's known to many as a diplomat's wife but Sharmila Kantha is a gifted writer as well". Sunday Times. Retrieved 4 September 2014. ^ N Sundaresha Subramanian (25 February 2014). "Jayant Sinha rides into Hazaribagh". ^ "Jayant Sinha". Omidyar.com. Archived from the original on 22 January 2013. Retrieved 4 July 2013. ^ "Sumant Sinha starts own firm – Money – DNA". Dnaindia.com. Retrieved 4 July 2013. ^ "Musings of a Swadeshi Reformer". Yashwantsinha.in. Retrieved 18 March 2013.